NextWorth asks questions about your phone before giving you an offer. The moment Steve Jobs announced the iPhone 4 from the stage of Apple’s (s AAPL) Worldwide Developers Conference in June 2010, gadget buyback service Gazelle’s servers started churning. In just 60 minutes following the introduction of the new iPhone, Gazelle had already agreed to buy back 3,000 iPhones from individuals looking to dump old models. By the end of the day, that number had jumped to 10,000. “That shocked us,” recalled Anthony Scarsella, Gazelle’s chief gadget officer. All told, Gazelle bought back almost 32,000 iPhones in 2010, according to the company. Apple phones account for one out of every 10 consumer electronics devices the company buys back. And they’ve found that the people who are using the site to sell their out-of-date iPhones aren’t motivated by unhappiness with the device–they’re generally looking to upgrade to the latest version and make some money in the process. Gazelle is one of several companies that buy back old gadgets and resell them. There’s also NextWorth, and eBay Instant Sale (s ebay), to name a few. Buy back deals generally work like this: You tell the site what kind of consumer electronics item you want to get rid of, answer a couple of questions about its condition, and they will make an instant offer. You send it in and in return get cash, a PayPal payment, or sometimes a gift card to a chosen retailer. It’s like Craigslist or eBay auctions, but much, much more efficient. This year, things haven’t been business as usual for iPhone resellers–for comparison’s sake, Gazelle has only taken in about 18,000 iPhones so far. Since 2007, Apple has updated its iPhone model in June or July, and resellers have been able to count on that bringing in a fresh round of old iPhones for them to buy and resell. But July came and went and still there hasn’t been an official peep from Apple. It’s widely believed an updated iPhone will come sometime this fall–bets are either in September or October. In the meantime the reselling ecosystem that’s been built up around the iPhone is on pause. We, along with just about everybody, think there will be another iPhone soon. PriceGrabber recently found that 35 percent of the people it polled plan on buying whatever phone Apple comes up with next. If you’re one of them, and want to make some money off an older model iPhone, here are some tips for getting the best offer from buyback sites. Make sure your phone is in decent condition. Cases are your friend! This is fairly obvious, but the fewer scratches and dents on your phone, the better your offer is going to be. And be sure to keep track of your charger and cables it came with. All of these factors can play into the price you get. The earlier you pull the trigger, the better. Gazelle’s Scarsella, for example, says that the first three hours after a new iPhone is announced is the best time to trade an old model in on their site. Shop around. Offers will vary. 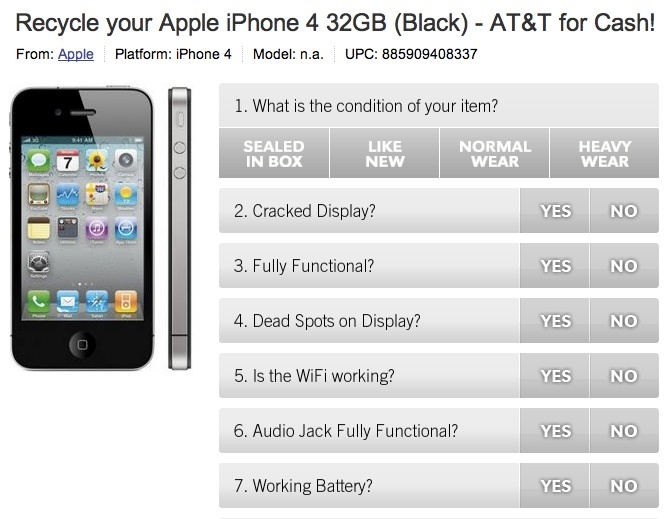 Right now, for example, NextWorth is offering a 32GB black iPhone 4 with normal wear and tear for $242. eBay Instant Sale will garner $238 in trade-in value for a 16 GB iPhone 4 , and Gazelle is offering $154 for a 32 GB iPhone 3GS. But this can all change once an iPhone 5, or whatever it’s going to be called, eventually is revealed. You can also sell your used gadgets and cell phones to Technollo. Visit http://www.technollo.com for a free instant offer.